During the final week of August 2016 I, and 108 of my new classmates, filed into the Sir Charles Tupper Medical building at Dalhousie University. The air was filled with nervousness and also excitement as we officially began our four year journey to becoming Medical Doctors. That first week was a whirlwind of presentations centred on important issues such as: financing our education, professionalism, ways to get involved in the school community and our new curriculum. 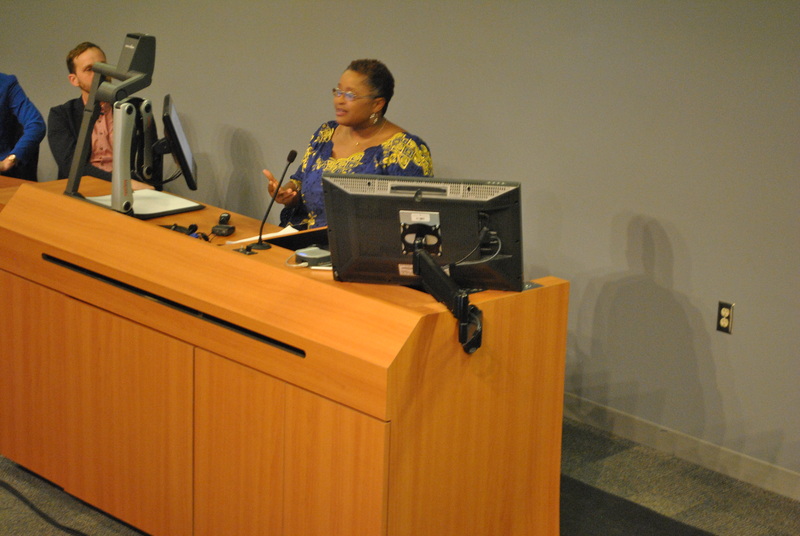 On my second day as a medical student I was pleasantly surprised that our program directors, in consultation with two student committees: Health Association of African Canadians-Student Organization and Medical Student Diversity and Inclusion Committee included a 90 minute session, presented by the Human Rights, Equity, and Harassment Prevention Office entitled, “The Elephant in the Room.” During my years as a pre-medical student I had heard about the changing landscape of medical education and medical practice. Specifically, I learned that there is a shifting focus within these spaces; from an exclusively biomedical focus to a perspective that is whole-person centred. I learned that the medical education system is working to acknowledge the importance of factors such as social determinants of health (e.g. culture, ethnicity and income) in improving the health of patients. 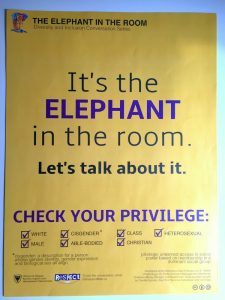 “The Elephant in the Room,” was billed as a conversation series which would introduce my class to discussions surrounding diversity and inclusion. The inclusion of this workshop as a featured part of the second day of medical school helped to assure me that Dalhousie and the medical school is genuinely committed to training physicians who are aware of the importance of not only diversity, but also inclusion. As a Black Canadian with Nova Scotian and Caribbean heritage I have often found that I am one of the only Black women, or persons of color, in certain academic settings. 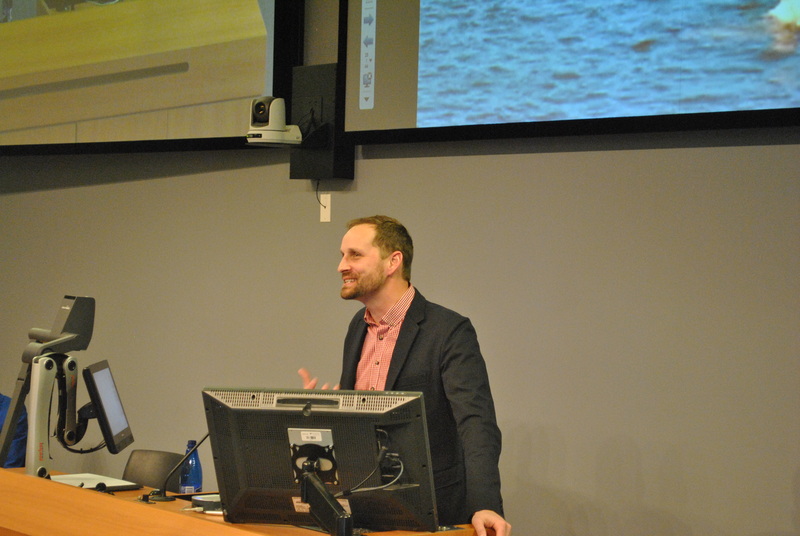 One of the reasons that I chose to attend Dalhousie University for my medical training is their commitment to recruiting students from, and serving the health care needs of, this province’s under-represented groups (e.g. 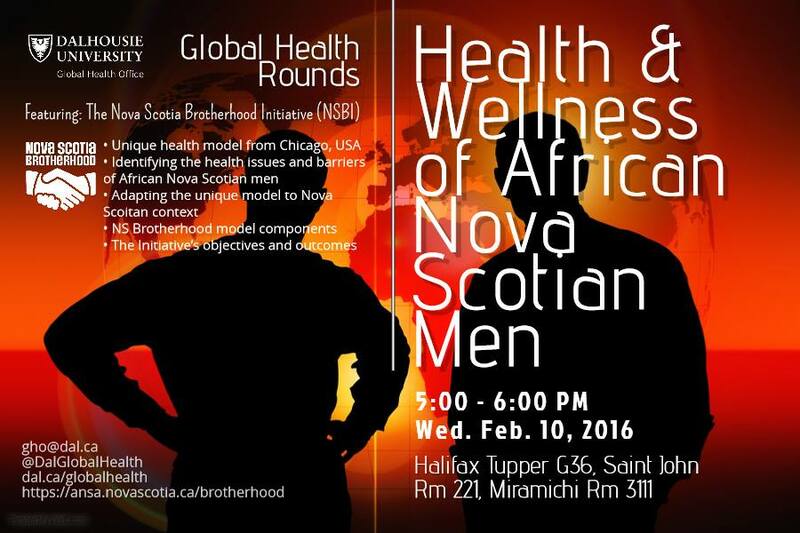 Aboriginal and African Nova Scotian) through programs like the Aboriginal Health Sciences Initiative and Promoting Leadership in health for African Nova Scotians or PLANS. 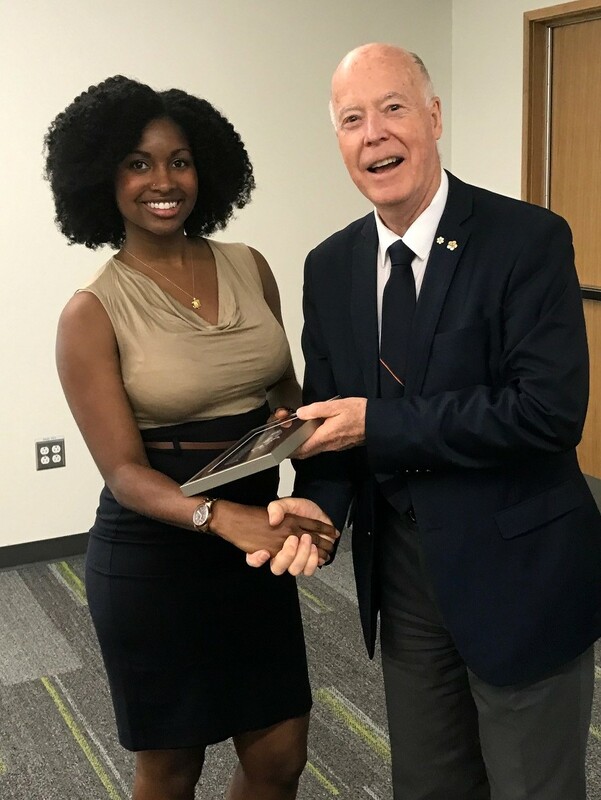 In addition to this, the PLANS Program Manager, Michelle, supported me throughout my journey to medicine and has also created a supportive network where I can connect with other Black Canadians in medicine as well as Black physicians for mentorship. 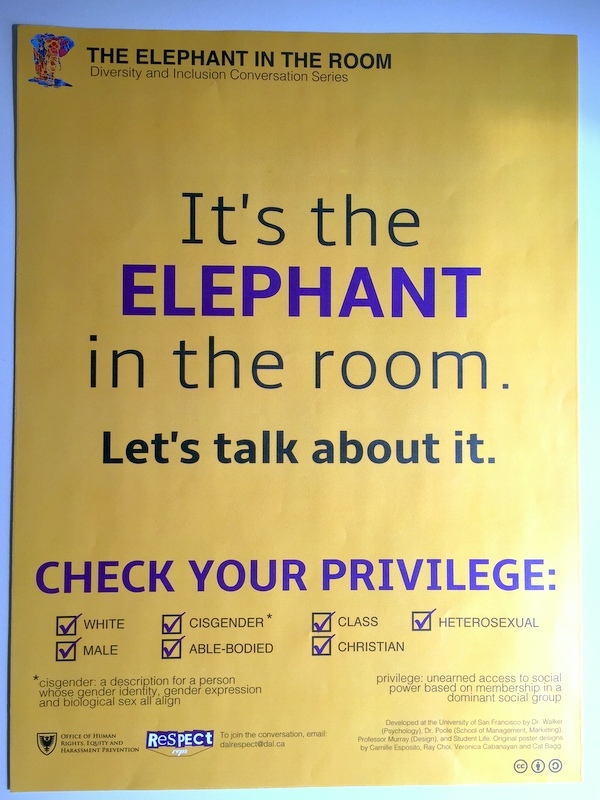 The Elephant in the Room provided my classmates and I with a safe space to talk about issues that can, at times, be uncomfortable. For instance, how do the labels that those around us wear, impact our interactions? In what ways do we experience oppression or privilege in our own lives? How does inclusion relate to diversity? 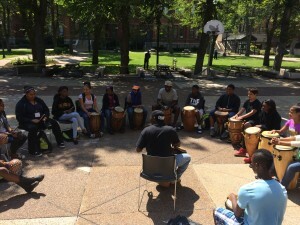 In my own educational experience, I have found that when these important conversations are not explicitly and safely introduced in the classroom the onus may fall on marginalized students to challenge stereotypes and to ensure that diverse perspectives are included in classroom discussions. I appreciate that we had the opportunity to begin having these dialogues early in our medical education journey; and I hope to see these conversations continue as I think that they are essential to ensuring that we take the best care of our future patients and our fellow classmates. One final takeaway that I received from participating in the Elephant in the Room session was the importance of allyship. 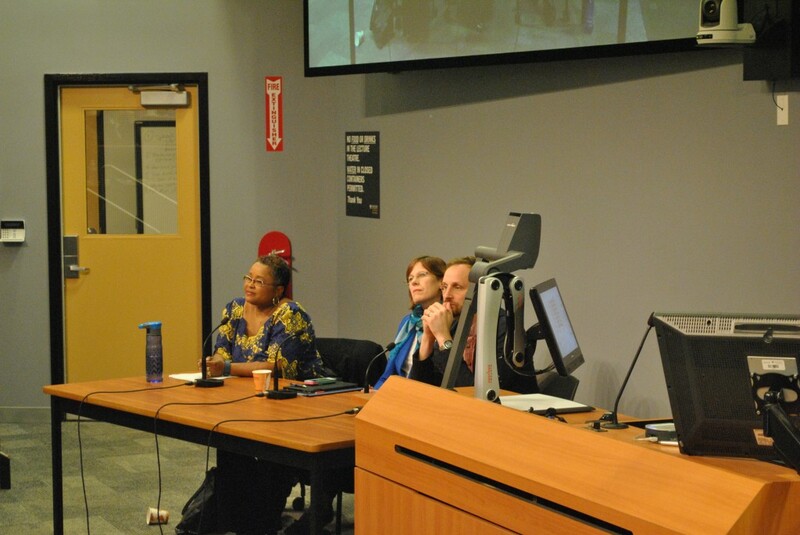 We learned that allies are people who recognize the unearned privilege that has been bestowed upon them by society and who work with marginalized groups to confront injustice. 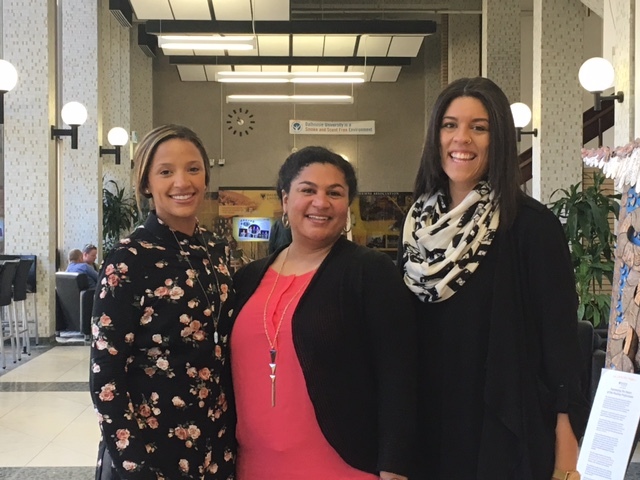 As future physicians, patient advocates, stewards of the healthcare system and as members of our community, I believe that it is essential that my classmates and I make a conscious, daily effort to be allies. We all must continually re-evaluate our privilege, continue to have important and sometimes difficult conversations and continue to build supportive relationships with the diverse populations that we aim to serve. As September arrives, the noises of campus change from construction to students talking about health equity, diversity, global health and partnerships. The Global Health Office has grown with a new service learning program, more established initiatives for African Nova Scotians through PLANS, international elective opportunities are growing and we are always identifying opportunities to continue embracing and supporting social accountability across the health faculties. This year, our work will fall within the theme of “Shaping the Future Through Partnerships” and you will see multiple new initiatives throughout the year. 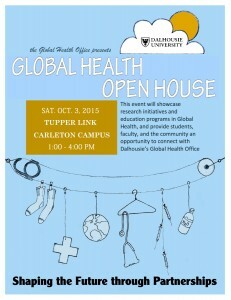 Please join us on Saturday October 3, 2015 in the Tupper Link from 1-4 pm as we host our annual Global Health Open House which will showcase the diversity within our programs, partnerships and reach across and beyond the campuses. 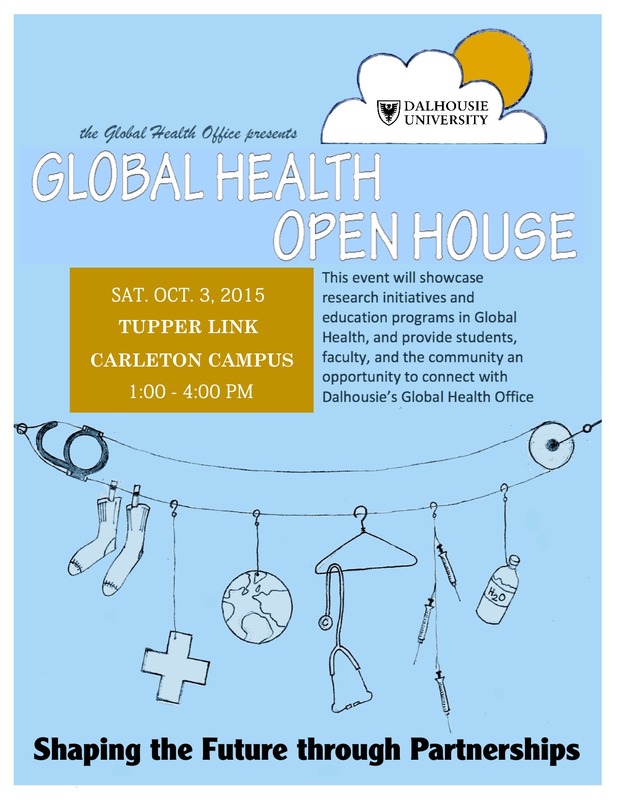 We are thrilled to be presenting our Open House in partnership with the Dal Med Global Health Initiative (GHI) who will be facilitating the Global Health Living Library: Stories that Bind, A Living Library of Healthcare Experiences, which allows us to bring together a stronger more collaorative voice of global health at Dalhousie. 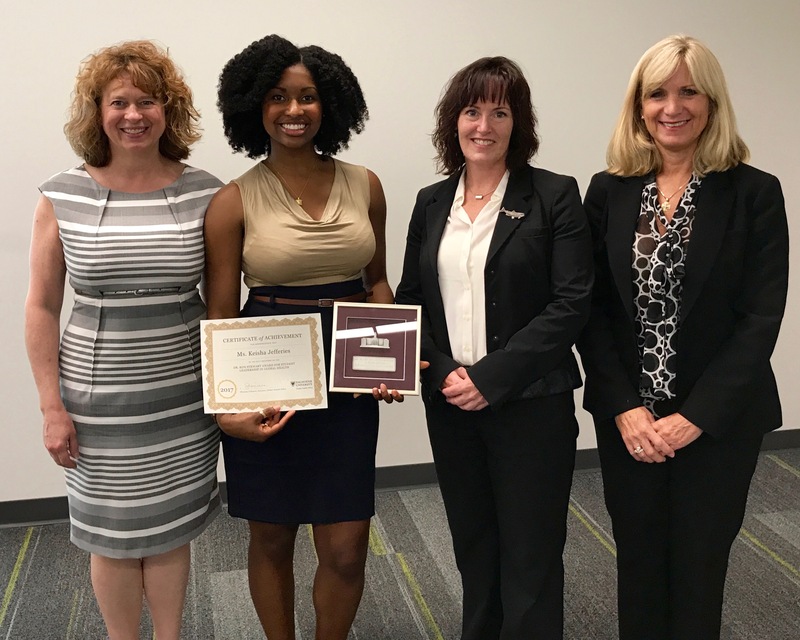 We look forward to working with students, faculty and staff from across the multiple campuses at Dalhousie University and continuing to collaborate with our local and global partners. Don’t be a stranger. 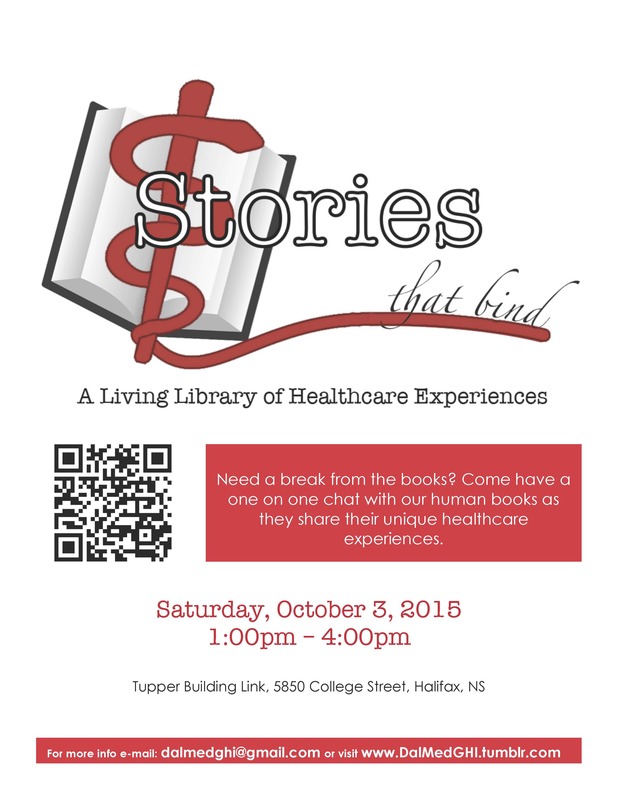 Come see us in person or through our virtual presence. 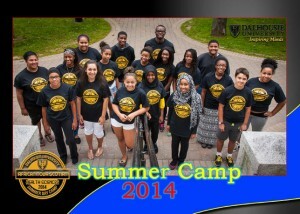 One of the highlights of being the program coordinator for PLANS* is the African Nova Scotian Health Sciences Camp. 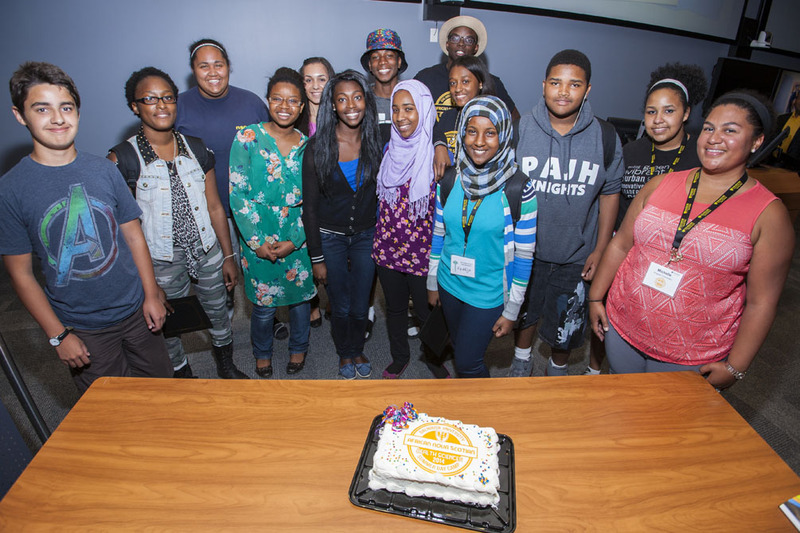 For the past two summers a fun-filled week for students of African descent in Grades 8-11 to learn more about the health professions and the opportunities available to them in post-secondary education has been coordinated. 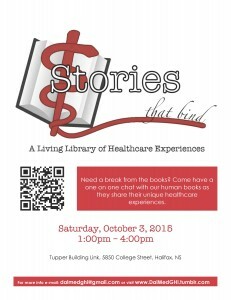 In collaboration with a number of departments across the Dalhousie University campus, these students participate in hands-on activities to give them a real sense of what it would be like to be a student in medicine, nursing, or occupational therapy – just to name a few. This year we had over 50 applications from students across the province. From this group of amazing candidates, 20 students were selected representing all regional school boards as well as the French board. 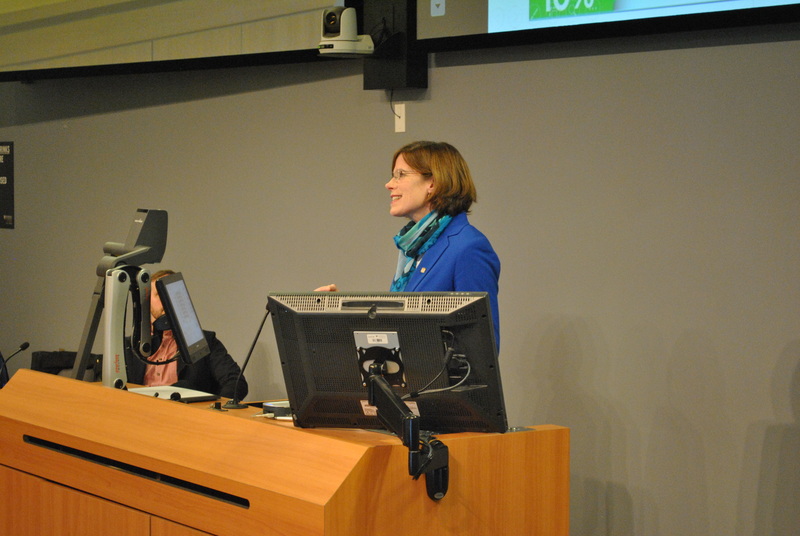 Three counsellors were hired, each studying health or science at the post-secondary level. The group stayed at LeMarchant Place, the newest residence on Dal’s campus and ate at the dining hall in Howe Hall. It was a fantastic week, but don’t take my word for it – here is a post from one of our campers! My name is Nikita Morris and I am 16 years old. I attend CEC (Cobequid Educational Centre) in Truro and I am entering my grade twelve year. I didn’t even know this camp existed until my math teacher approached me in the halls at the end of the day. 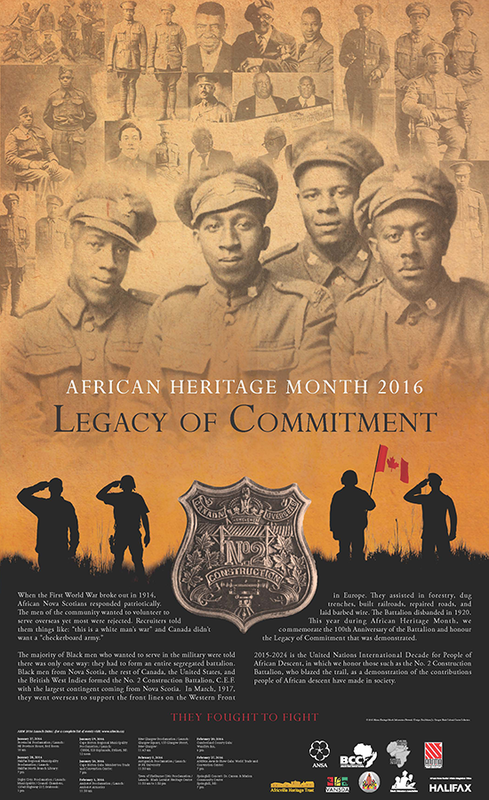 I was hurrying off to get to my bus when she stopped me and asked me if I would be interested in applying for the African Nova Scotian Health Science camp. At first I didn’t really want to go. I expected it to be like the last camp I went to – boring, strict counselors, nobody becoming actual friends, and not really learning anything new. I was completely wrong about this camp. I finally stopped complaining and just went. I’ll admit that it was probably one of the best things I’ve experience in my life so far. 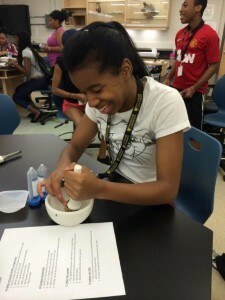 I learned a ton of new things, like how to extract the DNA from a banana, how to give a tooth a filling, I learned what occupational therapy is, and the things they did in physiotherapy plus a whole lot more. 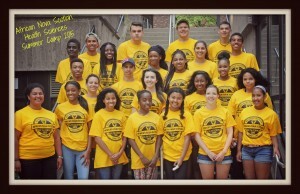 The camp counselors, Liette, Karissa, and Nii were so nice and weren’t strict unless it was necessary. Which was hardly ever. The first day of camp everyone bonded with each other and started talking to each other. One of my favorite things, besides how everyone got along, what I’ve leavened, and how cool the counselors were; was how they assigned us with a mentor. Not just a mentor for that session but a mentor for whenever we had a question about university or college, or how to apply for a scholarship. 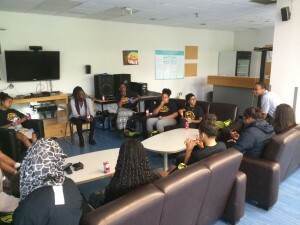 The mentors really listened to what you had to say and they even gave good advice. I really do plan on keeping in contact with my mentor this upcoming year. There was never a dull moment at the camp and I loved every second of it. The thing that surprised me the most was how confident I was. Normally it takes me a minute to get used to people but not here. Everyone was so welcoming. We had a variety show and I actually got up and danced in front of people, which is something I hardly ever do. This camp really helped me with my confidence. I was always comfortable with talking to adults and shy talking to people my age. Being at this camp really helped me with being comfortable with talking to anyone. I wish I could’ve stayed in the camp forever but I have to keep moving forward and continue to experience new things. My next steps are to graduate high school and go to university to study psychology. Though I’m interested in working in film I also want to study psychology. Who knows, maybe I’ll do both. Anyone thinking about attending this camp I’d tell them to go for it. I’d tell them how much fun it is and the different types of health sciences that you learn and how much they’d most likely love it. It’s good to try new things and meet new people. It’s also fun staying in residence and getting free food. Aside from that I’d say how nobody is judgmental and they’re very welcoming. You never know, this may be the best thing you’ll experience all summer. 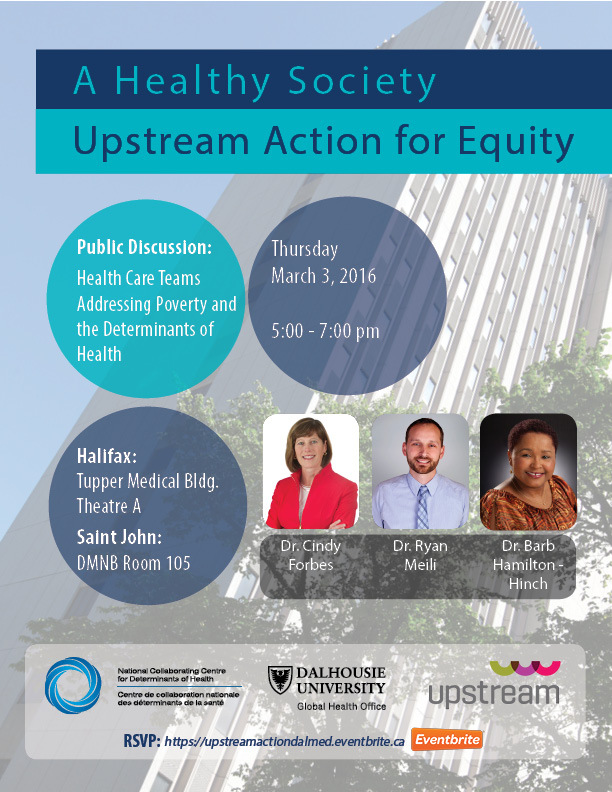 For more information on this program please visit our PLANS webpage or contact Michelle at michelle.patrick@dal.ca.